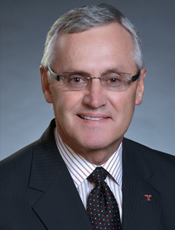 James P. Tressel became the President of Youngstown State University on July 1, 2014. A native of Northeast Ohio, Tressel graduated from Berea High School in suburban Cleveland in 1971. He earned a bachelor’s degree in Education from Baldwin-Wallace College in 1975 and a master’s degree in Education from the University of Akron in 1977. He also received honorary degrees from YSU in 2001 and Baldwin-Wallace in 2003. He previously was executive vice president for Student Success at the University of Akron, where he was charged with restructuring and leading the efforts of a newly created division dedicated to the academic and career success of students. Tressel’s areas of responsibility included recruitment and admissions, financial aid and career services, advising and adult/transfer services, the military services center and multicultural academic programs. He spent a great deal of time in the Northeast Ohio region, emphasizing the need for top-notch higher education, innovation and collaboration. Prior to joining the University of Akron, Tressel was head football coach at Ohio State University from 2001 to 2010, where his teams won the national championship in 2002 and seven Big Ten championships and appeared in eight BCS post-season bowl games. As head football coach at YSU from 1986 to 2000, Tressel’s teams won four Division I-AA national championships. He also was executive director of Athletics at YSU from 1994 to 2000.